I noticed something about You are not allowed to view links. Register or Login to view. which might be relevant. A quick search on the forum didn't bring up much, apart from JKP's suggestion that it may be a sundew and David's fan palm. I see why one would think of Sundew (the curl of the flowers) but it seems to me that there are more arguments in favor of something palmy. An obvious indication is in the stem, which seems to bear the typical marks of lost leaves. Although I'm sure this also appears in other kinds of plants, it is most notable in certain kinds of palms. This again reminds me of palm trees, which easily develop differently colored leaf tips. That does leave to be explained everything that's blue, from the insides of the leaves to the big flowers to the curled structure. Thoughts? Edit: I guess the blue could indicate a further color gradient. Leaves which start a deep green in the centre, look greener in the fingers and tend to discolor at the tips. The bottom of the stalk certainly resembles palm, but there are many plants that have a scaly texture where the stalk emerges and the two parts you singled out need to be evaluted in the context of the whole drawing. I have a few IDs for f56r, but the two at the top of my list are Drosera (the leaves are more spatula shaped) and Echium vulgare. I think we're in a situation where each proposed ID has to ignore a significant part of the drawing. It looks like the VM drawing tries to capture the back-and-forth pattern of leaf scars found in certain palm species, rather than a general scaliness. And since the leaf is usually considered to be the most reliable part of VM drawings, I'd almost certainly rule out Echium with its tiny spikes. I see where you're coming from with sundew and I'm quite familiar with this plant. I guess you could argue the added bit on the leaf spikes is somehow supposed to represent the droplets. But see how the flower stem in the VM spirals up on itself, more than two times 360°. It looks like an exaggerated (maybe mnemonic?) feature, als less reliable. You've found parallels for the bottom 1/3rd of the plant. How do you explain the top 2/3s (the long skinny curving stalk and asymmetric flowers)? 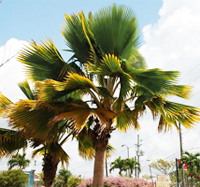 Also, a quick question... Palms with that kind of base tend to be from China (it looks like it might be a Chinese Chu-san or windmill palm Trachycarpus fortunei ?). Do you happen to know which kind of palm is in the pic? My guess might be wrong, but palm trees don't all have that form of base. I could hunt for it, but it's probably easier to ask. 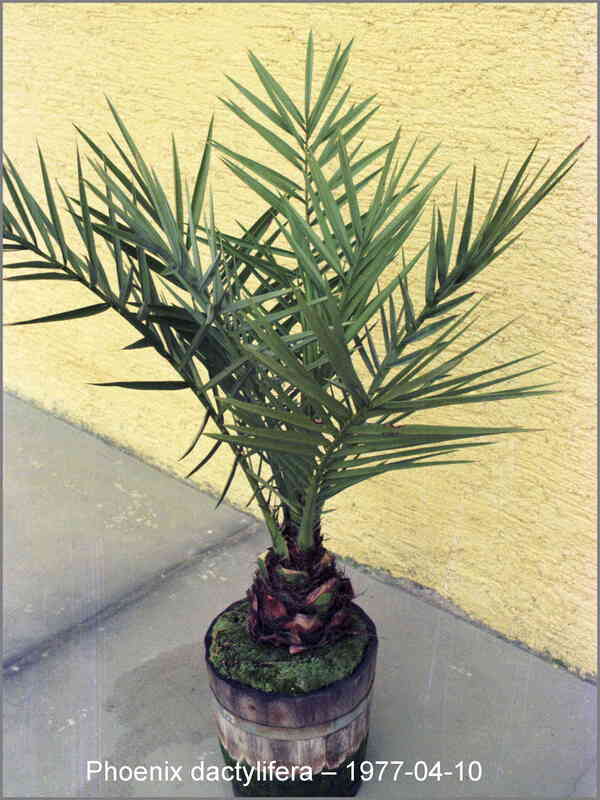 This is Phoenix dactylifera (a younger one), the date palm. It is frequently included in herbal manuscripts. I've wondered for some time if You are not allowed to view links. Register or Login to view. might represent this palm, but I'm not completely sure. The VMS drawing also resembles certain ferns and fernlike flowers, perhaps more than the palm. It was oneof the first pics that came up when I googled fan palm. This is Washingtonia robusta, a species unlikely to be in the VM, though certain botanists would happily disagree. By the way JKP, look at the way the leaf stalks in the VM drawing connect to the stem. They follow the same alternating sheething pattern.